People like to show off their wheels, especially if they are classic autos. Car shows are an important part of many community celebrations during the summer. Various awards and plaques are presented at these car shows. So, check the schedule below and get ready for a good time at a local car show! Here is what usually occurs. Specific dates for West Michigan Car Shows in 2019 are being added as they become available. - Annual West Shore ESD Automotive Technology Program and NAPA Auto Parts Car Show, 1pm-3:30pm, NAPA Auto Parts Store, U.S. 10, Ludington. - PM Motoring Club annual charity cruise/poker run, leaves from McDonald's at 11am, proceeds benefit Staircase. - Ludington Shines Car Show, O'Reilly Auto Parts, U.S.10, Ludington. - Father's Day Car Show, 1pm-4pm, Doc's Sauble River Inn, Free Soil. - Car Show, 6pm-8pm, Country Lanes Bowling Center, US 10. 12&13 - Summer 10 + 31 Festival in Scottville Cruise and Classic Car Show, Scottville. - Rides from the Past Classic Car Show, 10am-3pm, Free Soil Ball Field, Free Soil. 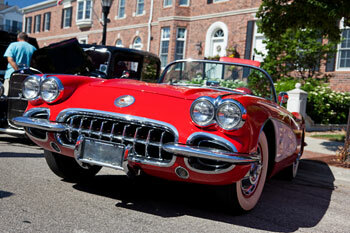 25 - Car Show, 2:30pm, Oakview Medical Care Facility parking lot, Diana Street, Ludington. - PM Motoring Club car show, 9am-4pm, MCC high school parking lot, Scottville. 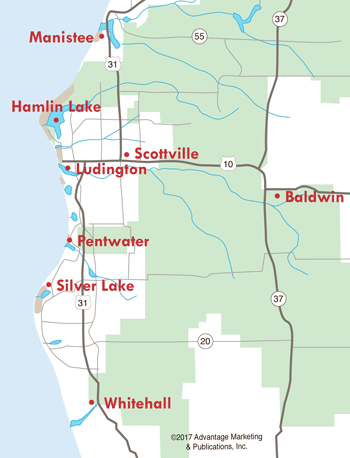 - Motorcycle Show, 6pm-7:30pm, Oakview Medical Care Facility parking lot, Diana Street, Ludington. - West Shore Cruisers Back to the '50s Rock and Roll Car Show, Ponderosa/El Rancho parking lot, U.S.10, Ludington. The Pere Marquette Historical Motoring Club organizes weekly cruise-ins, weather permitting. McDonald's Cruise Night, Tuesdays, 6pm-8pm, meet in the McDonald's Parking Lot, cruise at 8pm.